Anyway, I am taking some rest. So, wanna get back to MATLAB. We are starting with DSB-SC scheme for modulation and demodulation. 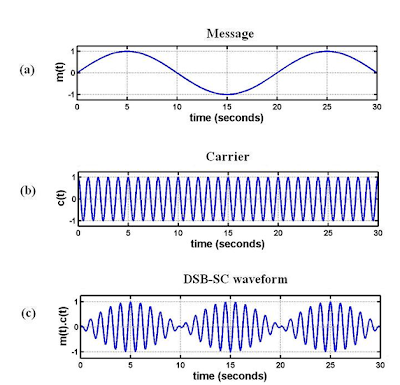 And then we will discuss Analog Qudrature Amplitude modulation scheme for sending two different signals at the same frequency band modulated with sinusoid carrier. For one signal to be modulated, we are using cosine and, for another is modulated by Sine. And we will also write a code in MATLAB to do the analysis. Let’s look at the simple modulation scheme. Here n is time domain representing variable (continuous time). And Acoswo­n is carrier wave. And mixer multiplies these two signals in time domain and generates the output y[n]. 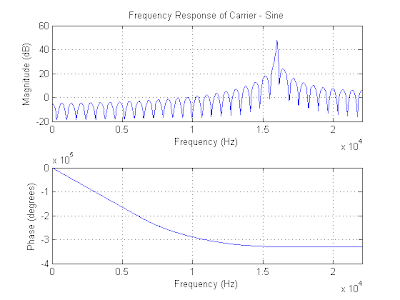 From Figure 2, Modulated signal is having carrier varing in the amplitude with reference to the message signal. This scheme is also called DSB-SC (Double Side Band Suppressed Carrier). 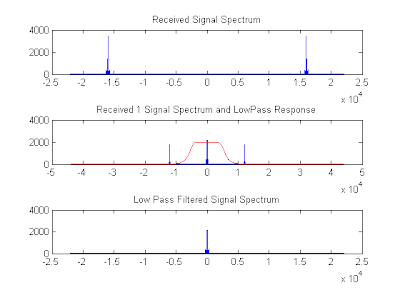 DSB-Sc in frequency domain is shown in following figure. 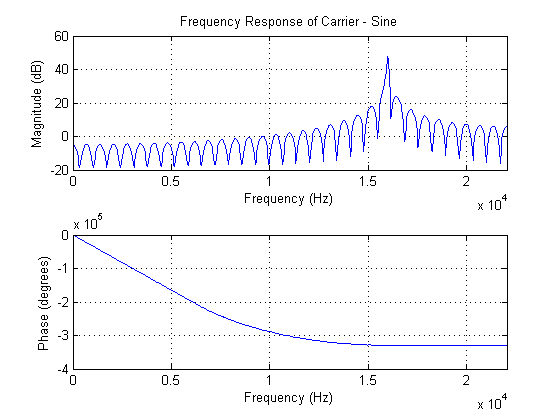 From the frequency domain representation, message signal is of bandwidth FM and frequency of carrier is Fc. 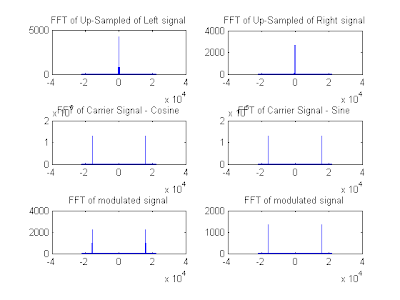 The Modulated signal is shifted to + and - Fc. And the bandwidth of modulated signal is doubled i.e. 2FM than the modulating signal. To demodulate the signal at the receiver end, we will multiply the received signal i.e. 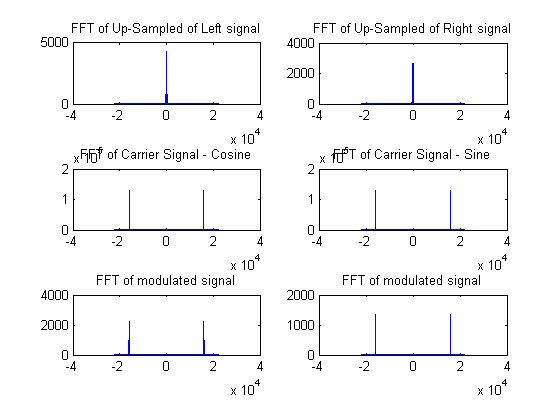 y[n] with locally generated carrier (can be extracted from received signal) and then Low Pass filtering of the signal will give the original signal back… This way we can send a signal over the channel i.e. wireless or wired. 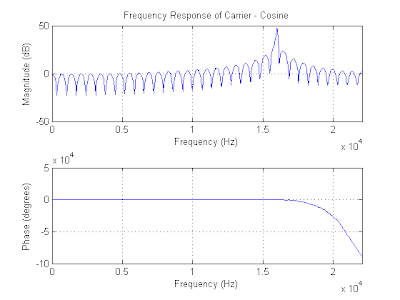 It is possible to modulated one signal by sine wave and other by cosine and add them together to get the modulated signal. By using this, we can save the requirement of different frequency band for other signal. This is also called Analog Quadrature Amplitude modulation (Analog QAM). Let’s look at the model of QAM. Here, two different signals x1[n] and x2[n] are being modulated by Acoswon and Asinwon (i.e. 90o shifted of Acoswon) respectively. So, the output of two mixer will be Ax1[n]coswon and Ax2[n]sinwon. 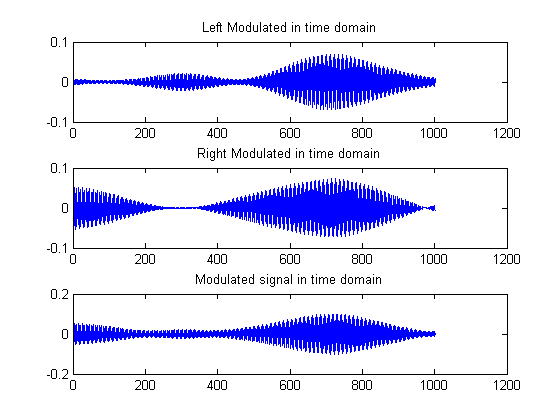 Now the next stage is to add these two signals to get the modulated signal y[n]. This signal y[n] is transmitted through channel and it is received by the receiver. r2[n] = A/2 x2[n] + A/2 x1[n] sin (2won) - A/2 x2[n] cos (2won). Now to get both the signals back, we will pass these signals with low-pass filter with cut-off frequency = wm. 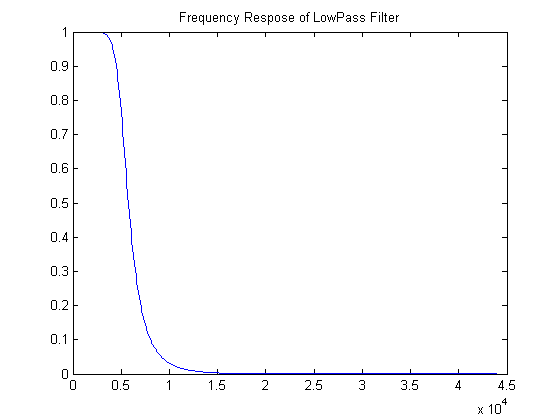 So the output of low-pass filter will be A/2 x1[n] and A/2 x2[n] respectively. And hence, we will get both the signals at the receiver end by transmitting in the same frequency band. Now this is the time to implement this scheme in MATLAB. For doing this, we will use an audio file (in wav format). This file have two audio component i.e. 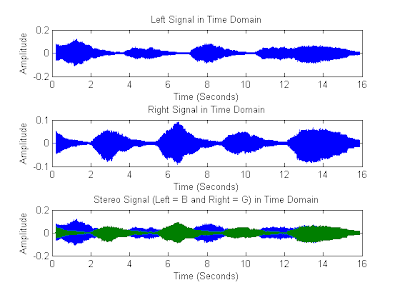 left and right audio. 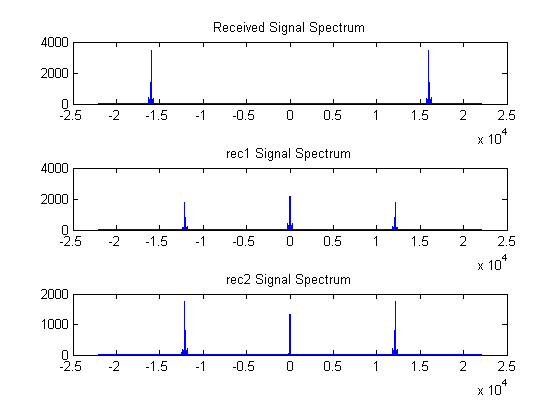 So, we will get two different signal like x1[n]=left signal and x2[n]=right signal. 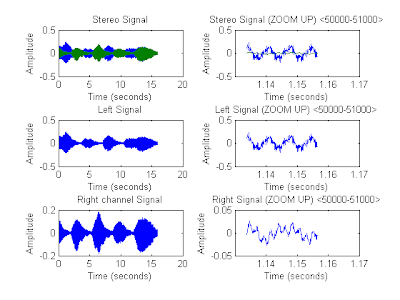 Now, we will modulate these signals with sinusoid signals of freq wo = 16kHz. 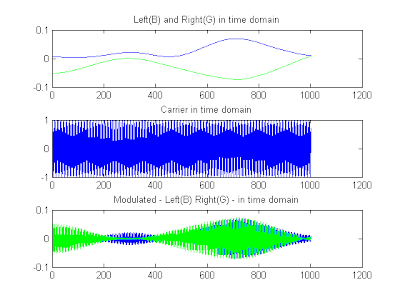 But t do that, first we need to understand the problem with matlab to do modulation. 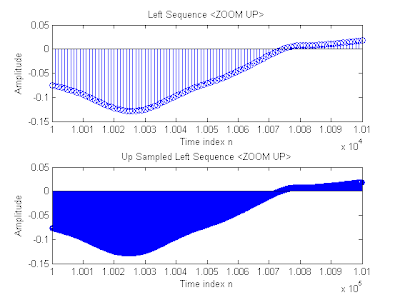 Matlab works with signal in terms of matrix. All matrix are discrete quantities. 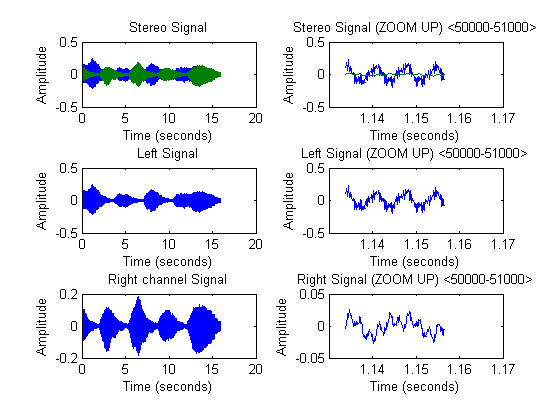 So, to get the perfect (not perfect but somewhat more) glimpse of analog signal we will up-sample the signal by 10. And then we will modulate it add it and transmit it. To understand the modulation and demodulation only we are not considering the noise (In practice, the noise will always be present). Now, at the other end, received signal is same as transmitted signal because, noise is not considered. So, to get the original signal back, we will multiply the signal with in-phase and quadrature-phase component of wo frequency. 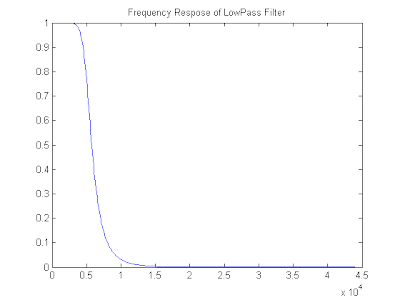 Then for low-pass filter we will design Butterworth low-pass filter having pass band frequency 4kHz and stop band = 10kHz. The next thing is to down sample the signal to remove the extra samples which we have added at the modulation time. Now we will get the left and right signal back. To get the original audio signal back i.e. 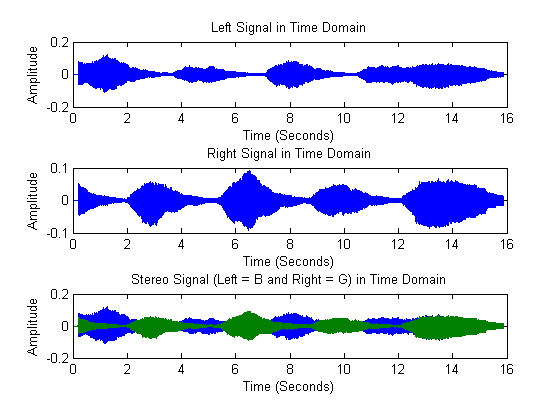 stereo signal, we will structure the matrix of received left and right file. And then we will listen the audio. Following are the figures, which will help to learn in better way with graphical representation. Figure 16. 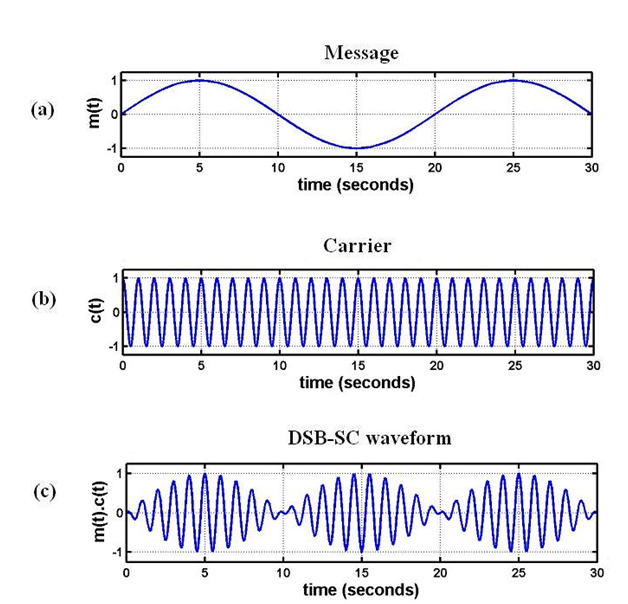 Frequency Spectrum of Message signal, Carrier and Modulated wave. Figure 19. Frequency Spectrum of Received signal, Multiplied received signal with carrier overlaying the bandpass response and low pass filtered signal. % Aim : To implement the analog Quadrature amlitude modultaion scheme on stereo. % sinusiod wave. Then add it. And transmitting the modulated singal. % demodulation process, assuming the nosie on the receiver end is zero i.e. If you would like to do some innovation like adding an additive white Gaussian noise, changing the filter type i.e. chebysev, Elliptic, Bessel,etc.